This moment affords me a special opportunity to extend my hearty congratulations to the graduates - to the Class of 2005. This is your day. Your memories will forever cherish this occasion, and there will surely be few times in your lives when you will be surrounded by so many who care so much about you. Your hearts, I know, are filled with many things on this day. My custom, and my pleasure, is to participate with you in acknowledging one of them: a sense of gratitude. I join you and ask you to join me in thanking the faculty who taught you, as well as learned with you, the families who sacrificed for you, and the friends who have sustained you. Among those who join us today are members of the Class of 1955. 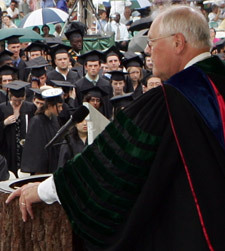 They share with you the distinction of having matriculated as the largest class in Dartmouth's history. They also share with you, I am sure, the sensation that this day has come on quickly - very quickly. If they were to advise you now, I suspect that among other things they would say is that life cannot be counted on as living out according to plans. Adjusting to the twists and turns that will abruptly confront you is the sign of a good education - and such adjustment is something the better and the more pleasant when aided by those who care for you and when in the company of those for whom you profoundly care. There are those who suggest that the world of higher education is an ivory tower set apart from some "real" world. Let me say that this world-this so-called ivory tower, this world of ideas, of possibility, of wonder and discovery, of embracing difference and of celebrating accomplishment - that this world is indeed more real than are worlds marked by hatred, violence, and cruelty. Do not permit the cynics and the fearful to insist otherwise. Your task is to make the realities that are the everyday stuff of Dartmouth more common in the world at large. And so, here we come to your assignment-not simply your first assignment at Dartmouth, but your assignment for a lifetime. Now, four years later, that remains your task as you now move on from Dartmouth. My hope for you is that with the values that you have lived and learned and taught here, that you will advance the best of your dreams. You will be distracted to be sure, but never be deterred. In The Greatest Generation, Tom Brokaw reminded us of the sacrifices that the World War II generation made for this country. I, too, remember them coming back from the war - so young still and, yet, the innocence of youth was gone from them prematurely. Their legacy, though, may be less a result of their remarkable courage and sacrifice and more that they did not respond to history's heavy demand upon them by subsequently withdrawing into lives of cynicism and bitterness. They surely did not seek the task that they had taken on, but they did not turn away from it. And that, finally, is all that we can ask of any generation. While many of us would have been forgiven then for thinking that such a withdrawal from the world might have been a fine option, you never took that route. You know just how much you can do. You have no limits. But our work together here will have been incomplete if you think all accomplishments can be measured and counted. I hope you have learned here, too, the value of contemplative absorption in a good book, an inspiring performance, a stunning work of art, a quiet sunset, and simply good moments with good friends. I know that you have learned about service to others because we have observed the good works that you have done. Over the last thirty-six years I have seen a lot of classes pass across the Hanover plain, and it is impossible - and surely would be foolhardy to attempt - to make comparisons among them. But I can say to you, Class of 2005, that you are an impressive group. You leave your College the stronger and you have emphatically affirmed your intent always to make certain that it is. My farewell to you is tinged with regret that you leave too soon - but it is warmed by tremendous gratitude for what you have done and confidence in what it is you will do. So now, now it is time for leave-taking. We know you go forth in good and capable hands - your own. Near the end of the nineteenth century Walt Whitman wrote, "the strongest and sweetest songs yet remain to be sung." We leave them still, for your voices. But know too as you leave today that the door here is always open for you. You are ever a part of Dartmouth undying, as Dartmouth is forever a part of you.